J.D. 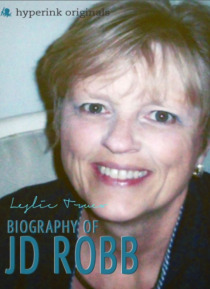 Robb is the pen name Nora Roberts uses for her In Death series of futuristic police procedurals. She is a prolific writer with over 200 published novels, 176 New York Times bestsellers, and over 400 million copies of her books in print worldwide. Over 34 of the books are from Robbs In Death series and since 2007, each In Death book has been a New York Times bestseller. Robb didnt grow up drea… ming of mystery, romance or writing. However, she was an avid reader and enjoyed making up stories. A snowstorm that left her alone with two young children and a need to fill the time, led her to write her stories down. Once she started, she didnt stop.